At some point I stop lamenting how early Halloween merchandise is showing up on the shelves and embrace it. That's what happened when I saw the new Wegmans reusable Halloween bags. Nabbed two immediately. I am such a sucker for seasonal items. you've got a tag open on your page somewhere - everything is struck through. That is so weird! I don't see it on my browser! Could you send me a screen shot to jennifer.cisneyATgmailDOTcom? 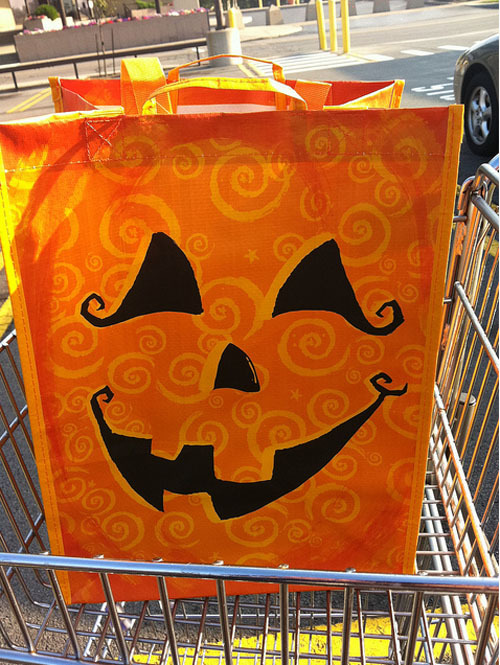 So funny - I was feeling the same way about Halloween until I saw these bags on Friday @ Wegmans! There are super cute and would make great trick-or-treat bags!